Holly & Jolly were born on Christmas Eve and the family was created on Christmas Day. They serve a happy and lighthearted purpose - gifting during Christmas (and re-gifting the gift without fear, as is the tradition of fruitcake)! LOL. 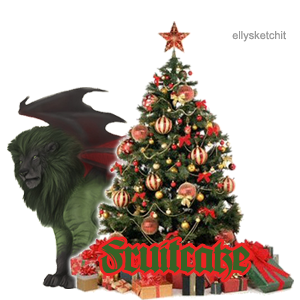 Because red & green - the manticore colors -- are Christmassy, I'd love to keep this family pure manticore, but if you breed something else in, don't worry. Please send any unwanted creature - including frozen eggs -- back to me so that I can send them off for unfreezing & keep the lineage going. Thank you!